Rin watches the shocking scenario on the television and rushes to his brother’s side. Meanwhile, Shura is pointing out to the authorities who have scooped Yukio up that he can’t possibly be the shooter and they are allowing the actual shooter to escape! Thanks to Mephisto’s injuries, however, the Gehenna barrier collapses! Rin is struggling to make sense of what has happened, and why Yukio is so determined to know the truth of their birth. Is it possible he has inherited the Satan gene as well? Rin goes to Yukio’s rescue and attempts an escape! But things do not go as planned, and everyone’s favorite double agent is on hand to add to the confusion. When the Koma sword breaks, will Rin survive? All I can say is wow, just wow. So much going on here. It’s literally mind-blowing. I can usually tell how things will work out, but right now I can honestly say I have no clue. Yukio is undergoing his own personal trials, but so is Rin. Is Shima taking advantage of the confusion to press his own agenda? What is his agenda? I keep wondering if this is all an elaborate set-up, whereby Yukio infiltrates the other side. He’s got the brains and determination to do something like that. Rin, not so much. But I can’t tell. And what a cliffhanger too, just as Mephisto is about to spill the beans to Rin about his and Yukio’s birth. What agony, especially not knowing how far away the next volume is. A riveting volume, a real page-turner, and one calculated to keep you on the edge of your seats! Please, next one soon! 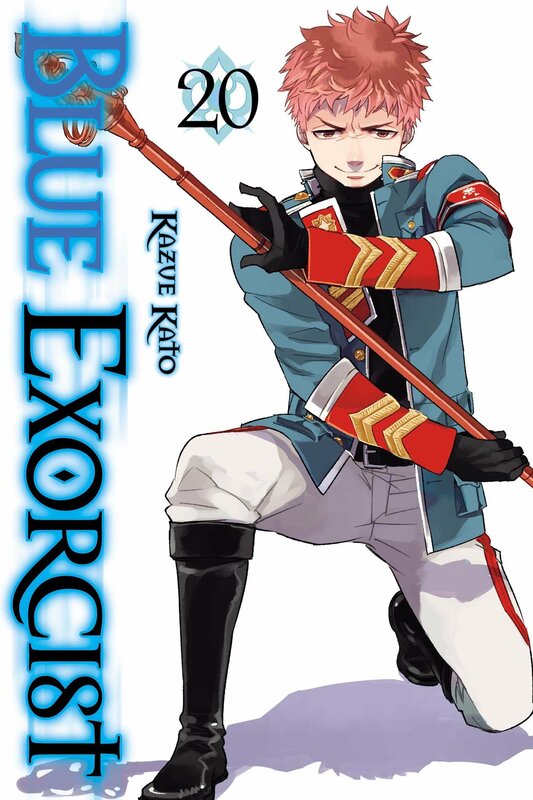 This entry was posted in Reviews and tagged Blue Exorcist, Book review, brothers, Exorcist, Julie Lynn Hayes, Kazue Kato, paranormal, son of Satan, Viz Media on April 21, 2019 by wedbriefsfic. The Ex-wires decide to throw a party—a combination birthday and Christmas party. Rin buys some cheap reindeer ears for himself and a moustache and glasses costume for Yukio, who is less than impressed. Shiemi dresses as Santa Claus and carries a large bag containing a full-sized decorated Christmas tree (it’s actually Nee). When tragedy accidentally ensues, they salvage what they can, and save the day by having a hot-pot party. As they are partying, Shima receives a call from his older brother Juzo—he and Mamushi are going to have a baby! Although they are officially married, they are going to have a ceremony for family, and they want Shima and Bon and Konekomaru to attend! After the party, Rin and Yukio learn, to their surprise, that Shura lives in their dorm too. Shura has had a bit to drink and mentions to them that she met their mother. Naturally, they want details, so Shura tells them the story, which occurred when she was a bratty little girl being raised by Father Fujimoto. Afterward, the brothers discuss what they found out. Yukio expresses a desire to know more about their mother, but Rin doesn’t, to his brother’s surprise. The Ex-wires all travel to Kyoto for the wedding. Everyone pitches in to help with preparations, although with his arm in a sling, Yukio is limited in what he can do. Lots of family members show up from both sides. Rin is concerned about his brother. He feels as if something is wrong with him, but he doesn’t know what. Even from Kyoto, Bon checks on Lightning, chastising him to get out of bed. As soon as he hangs up with Bon, Lightning places another call, asking about Dr. Dragulescu’s schedule. Shima is sitting alone, away from the festivities, when Konekomaru finds him. They have a talk, and Shima starts to feel better about himself. The Ex-Wires and a few others head to the temple for New Year’s Eve, with a stern warning to stay together, but Rin finds himself standing next to Shiemi, separated from the others. He reveals to her his feelings that Yukio is hiding something from him. Before they can really talk, though, they are discovered and the moment passes. New Year’s Day. Bon helps his father prepare for the wedding ceremony. He asks him about Father Fujimoto, but before Tatsuma can respond, he is called away. Afterward, Bon is seated next to Yukio, during the ceremony. Yukio overheard Bon’s question, and wants to know what Lightning is investigating. Even as they speak, Lightning is making his move, but Bon tells Yukio he can’t reveal any information regarding the investigation. The situation threatens to boil over when Yukio threatens Bon with a gun, but everything ends up being put on hold when the Ex-wires are recalled to handle a dangerous situation—a Cyclops is loose in Ikebukuro Station! There is a lot going on in this volume of Blue Exorcist, aside from the wedding and New Year’s and the baby. Yukio is trying to figure things out, such as why Father Fujimoto raised him and Rin, what is their mother’s story, and what do Bon and Lightning have to do with anything? Rin is trying to understand why Shiemi has chosen not to take the exorcist’s exam, although she assures him it isn’t because she is dying or moving or anything, but she can’t tell him the reason. She just can’t. We see Lightning in action and get a better feel for what he does. I have to say I’m liking him more than I did before. Shima is a hard person to get a handle on. As a double spy, it’s hard to say which is his true face, and which side is he truly on. Yukio reveals a surprising memory, which is a tender moment. I like seeing more of Shura as a little girl, it’s really cute. On pins and needles now, waiting for the next volume! 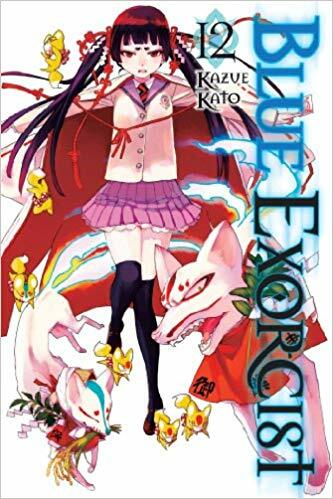 This entry was posted in Reviews and tagged Blue Exorcist, Book review, Julie Lynn Hayes, Kazue Kato, paranormal, Rin Okumura, son of Satan, Viz Media, yukio okumura on March 19, 2019 by wedbriefsfic. Maka is a scythemeister and a student at DWMA—Death Weapon Meister Academy. Her partner is a living scythe named Soul Eater. Maka’s goal is to make him into a death scythe worthy of being used by Death himself. In order to do this, Soul must consume 99 souls and one witch. Easier said than done. Currently, Death (also known as Shinigami-sama) is using Death Scythe as his current weapon. Death Scythe also happens to be Maka’s father, who is constantly yelling at Soul, warning him not to touch his little girl. When he isn’t busy being a major horn dog, that is. Despite his many protestations of love for his daughter, Maka spurns him, which reduces him to tears. Soul already has his 99 souls, all he needs is the witch. They find a witch by the name of Blair, so now the battle is on! Black Star is a shadow weapon meister who wields a demon shadow weapon called Tsubaki. So far, he has collected zero souls, mostly because he is an egocentric loud-mouth who can’t seem to keep from announcing his presence and his intentions even in situations that require stealth and silence. When Shinigami-sama tells them there is a special way to become Death’s weapon without absorbing the souls of 99 humans and one witch, Black Star wants to know more. This way involves humans who are stronger than normal humans. And there is such a human, named Mifune, who is nearby. He is the bodyguard for a witch named Angela. That’s all Black Star needs to hear. Off they go! Does he have what it takes to defeat Mifune and absorb Angela’s soul? Shinigami-sama has a son, Death the Kid. He wields two weapons, a pair of demon twin guns who are sisters, Patty and Liz. Death’s biggest problem is his unswerving need for symmetry. If something is asymmetrical, it throws him off his game and he becomes obsessed with making it right. His own hair distresses him because he has three white streaks on one side that are not on the other. As a shinigami, Death the Kid doesn’t need to collect souls, but he wants to make his own weapon with his own two hands. Because he uses two weapons, that means he needs to collect twice the number of souls. He asks his father if he knows anywhere he can get a large amount of souls. Shinigami-sama sends him to the pyramid Anubis in Egypt, where a necromancer witch is creating a large number of mummies. Will he be able to find the souls he needs and defeat the witch, or will his need for symmetry disrupt his plans? The first day of school! Maka is excited and goes to wake Soul, only to find him in a distasteful position! When she finally gets him to school, they speculate about who their new home room teacher will be as the previous one was killed. To Maka’s dismay, the new teacher turns out to be Death Scythe! From the beginning, he is very upsetting to his daughter, like when he announces he’ll only take attendance for the ladies. Luckily for Maka and Soul, their presence is requested by the Shinigami-sama, so they leave the classroom. They run into Black Star and Tsubaki, who have also been summoned. Can this be a special assignment for them? Or is it something a lot worse? 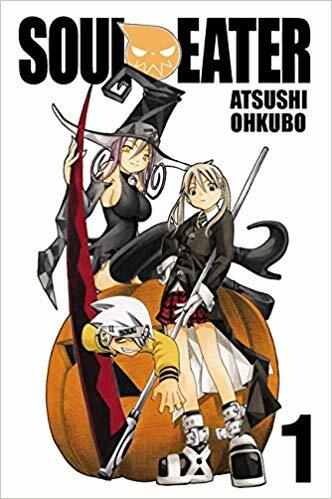 I loved the first volume of Soul Eater. The characters are interesting and the artwork is really cool. Maka’s father, Death Scythe, is pretty cute even if he can’t stop perving on all the girls. I like Death the Kid, even though he’s a little strange. There are a lot of strange people in this world, though, to be honest. We meet another one at the end of the volume, and learn what his relationship to Death Scythe is. I like the artwork, especially the color pictures of the moon. I would say my only real complaint is the amount of fanservice in just one volume. By which I mean lots of boobage. Which is great if you’re into that, not so much if you aren’t. I just tend to ignore it and move on. I am also watching the anime, which left me a little confused, which is why I decided to read the manga too. That makes the anime clearer. This story has a great deal of humor and a lot of soul – no pun intended. I recommend this for teenagers and adults alike. I look forward to reading volume 2. This entry was posted in Reviews and tagged Atsushi Ohkubo, Book review, Julie Lynn Hayes, manga, paranormal, shinigami, Soul Eater, Yen Press on March 14, 2019 by wedbriefsfic. While attempting to rescue Izumo from the clutches of the Illumunati madman, Professor Gedoiin, the exwires find themselves not only separated from one another but facing zombies! One by one they defeat their foes and assemble as a group once more, only to face Gedoiin. Gedoiin reasons that it’s only right for humans to experiment on humans, as they’ve experimented on animals for a long time. Just then her captors bring out Izumo. Ren goes into action and finds himself facing off with Shima! Rejecting the help of the exwires, Izumo agrees to take the Nine Tails inside herself. Can they stop the Nine tails without hurting its vessel, Izumo? 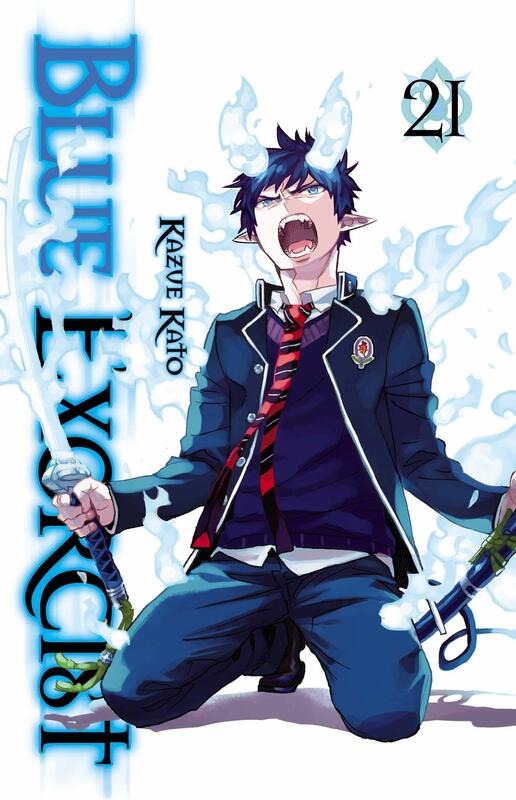 This volume of Blue Exorcist is not as Ren-centric as others. It showcases the exwires more as a team. We get a glimpse of Suguro and what he was like before he became his current buff and strong self. And Izumo sees another side of her otherwise weak and selfish mother. Professor Gedoiin is one of the creepiest villains we’ve encountered so far, and he doesn’t get any better in this volume. I’m still not entirely sure that Shima is the traitor he seems to be, either. To be honest, I’m not sure what purpose would be served by implanting the Nine Tails in Izumo, but I’m looking forward to seeing where the story goes now. Another good volume, can’t wait for more! This entry was posted in Reviews and tagged Blue Exorcist, Kazue Kato, manga, paranormal, Rin Okumura, son of Satan, Viz Media on December 27, 2018 by wedbriefsfic. Kamiki confronts Takara at the Festival and asks him point blank if he’s in the Illuminati, as Arthur Angel and Lightning deal with one of the two Vatican spies. Arthur reveals his ruthless side when he says that since there is another spy, he doesn’t mind if this one dies! Under torture, the spy reveals that the Illuminati are going to kidnap a girl from the Japan Branch within the hour, and that girl is none other than Izumo Kamiki! Shura instructs the exwires to begin a search for Kamiki. Meanwhile, Kamiki is still confronting Takara when help arrives… except this help isn’t quite what anyone bargained for. How can this trusted person be a member of the Illuminati? Nothing is what it seems, apparently. As if things aren’t confused enough, Mephisto arrives on the scene. One can never be sure what side he’s on. And right behind him is Lucifer, Mephisto’s big brother, who makes no bones about being a part of the Illuminati. According to Lucifer, they have declared war against the Knights of the True Cross. Lucifer and his cohorts depart – with Kamiki – to everyone’s chagrin. Mephisto instructs Yukio to take the exwires and get Kamiki back! When they arrive at their destination, which is a theme park, they begin to realize something is not quite right here. Although supposedly visitors come to visit the Inari Taisha shrine, an inordinate number of them are obsessed with the food and with staying at Dream Town Inari. What’s up with that? 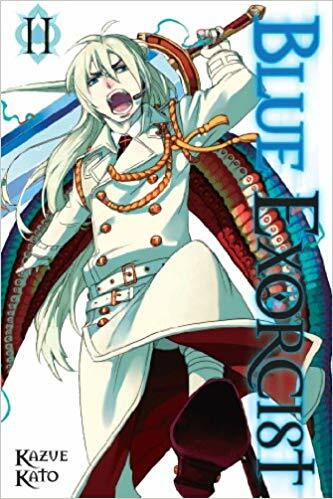 In this volume of Blue Exorcist, the exwires are faced with a major dilemma. Is one of their own a traitor, or is there more to the story, something they aren’t seeing? Betrayal is a bitter pill to swallow, especially in one who has been trusted as this person was. Rin gives him the benefit of the doubt, but Suguro is ready to rip his head off. This volume also delves more deeply into Kamiki’s background than we’ve been before, and we catch glimpses of a horrific childhood, which has made her the standoffish, non-trusting person she has become. Not surprising, considering her parents. I don’t know what to think about the traitor in their midst – is he really a traitor, or is something else happening that we aren’t aware of? I’m inclined to give the person the benefit of the doubt, but I suppose time will tell. The appearance of the masked Lucifer is interesting. Who is the man behind the mask? And what is his agenda? A bonus at the end of the volume is an illustrated guide to demons, which is interesting. So many questions that need answering! Looking forward to the next volume! 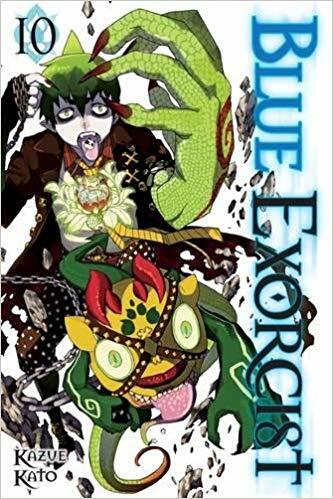 This entry was posted in Reviews and tagged Blue Exorcist, Book review, Julie Lynn Hayes, Kazue Kato, manga, paranormal, Viz Media on December 14, 2018 by wedbriefsfic. While Rin takes extra lessons to make up for getting a zero on an English quiz, Yukio goes to the Hall of Portraits to investigate one of the seven mysteries the ex-wires have been working on. There he runs into Shura, who is aware of the rumors regarding a certain portrait, which is said to show the observer the darkness in his heart. However, their meeting is no coincidence. She has come to tell Yukio he’s been summoned to go the Vatican the next day to give information on Todo, and she will accompany him. Meanwhile, the ex-wires are tackling a different mystery, that of the statue of Johann Faust which moves at night. As they argue among themselves, the statue begins to move! As he observes Rin and the others, Yukio wonders about himself, wonders why Father Fujimoto chose to raise them, and if Rin is the son of Satan then what is he? Lost in thought he finds that he’s wandered into the Hall of Portraits. Or was that but a dream? The ex-wires head to the Hall of Portraits after school, and find a cute doggy there, but it’s only Mephisto, up to his old tricks. He explains why this is the last mystery they can do, even though there are three others. The portrait in question is known as the family portrait, and it has recently become dangerous enough to require exorcism. The ex-wires must work together, each to his own strengths, to solve this mystery, and one steps forward to show unexpected leadership abilities. When the battle is won, Rin reminds Mephisto of his promise concerning the eye drops. At the Vatican, Yukio has to agree to some harsh conditions and seal them with his blood! He tells them what he knows and, after he leaves, the matter of the Illuminati is discussed. It seems that they have spies within the Order! Two in the Vatican and one in the Japan branch. Shura is ordered to find the spy in the Japan branch. A jealous Rin wonders why Yukio is meeting with Shiemi so often, but his brother is close-lipped about the matter. It’s not what Rin thinks – Yukio is helping to tutor Shiemi. The Academy Festival is quickly approaching, time for the classes to decide what they are going to do. Rin suggests doing tonjiru and rice balls, which he can make, so his class goes with that. When he learns that on the second night of the festival a concert will be held featuring some bands that he really likes, Rin is ecstatic. Until he finds out the event is couples only! What is he going to do? He would ask Shiemi, but she isn’t a student at True Cross, and he knows few other girls. All of the male ex-wires have the same problem. Izumo turns them all down. Suguro has the opposite problem – he keeps receiving invitations that he has to turn down! Things take an unexpected turn when Shiemi suddenly shows up! Is this Rin’s chance to ask her to go with him? I’m sorry there are no more of the seven mysteries to solve, it’s fun to watch the ex-wires in action, especially their interactions with each other. Rin has gained more of an acceptance from them, although they do remain aware that he is the son of Satan. I was confused when I noticed he keeps his tail out now, even at school, until I realized no one can see it who can’ see demons. Of course that includes his new friend Godaiin, who freaks out a bit when he sees the tail. Mephisto is ever the troublemaker, while I still don’t know what to make of Takara. The Festival is a welcome break and a chance to see the ex-wires acting more like the teens they really are than wannabe exorcists. I like the growing triangle of Rin-Shiemi-Yukio, although I suspect that Shiemi’s feelings for Yukio are more hero worship than anything, and I’m not sure what Yukio’s toward her are. I’ve known for some time that Rin likes Shiemi, but maybe it’s good for him to think he has competition, even if it’s his own brother. I dislike Arthur Angel as much as ever, but Lightning seems nice enough. I wonder who the Illimunati spy is. Takara is a too obvious choice. Guess we’ll just have to wait and see. Another good volume, bring on more! 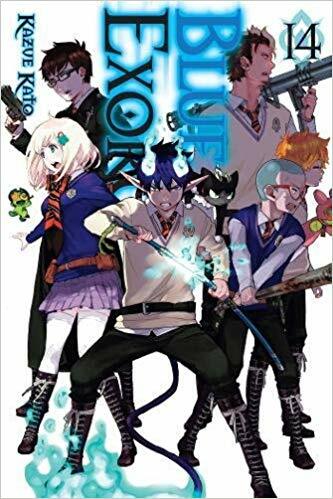 This entry was posted in Reviews and tagged Blue Exorcist, Book review, Kazue Kato, manga, paranormal, Rin Okumura, son of Satan, Viz Media on December 6, 2018 by wedbriefsfic. It’s back to True Cross Academy and on with classes for the ex-wires! While in class one day, Rin finds a fellow classmate who can also see demons apparently. His name is Godaiin, and Rin befriends him. Unlike Rin, Godaiin is disturbed by his visions and only wants them to go away. Rin promises to ask his exorcism teachers for a solution to Godaiin’s problem. Meanwhile, Arthur Angel and his angelic battalion have a situation on their hands, one involving the Impure Princess! I guess we haven’t seen the last of this family! A new mystery arises, involving a demon-eater, and the matter of Rin Okumura is temporarily suspended. Rin receives a dinner invitation from Mephisto – why, he has no idea. But he hopes Mephisto can help him solve Godaiin’s problem. Mephisto puts things into perspective for Rin, then tells him he has homework but neglects to tell him what it is. Yukio finds the Consultation center of the True Cross Academy Japan branch is busier than ever, and wonders why. Lord Pheles summons Yukio and the ex-wires to a meeting at a decisively strange hour – eleven PM! – in order to assign them a special lesson. They are to solve the seven mysteries of True Cross Academy that the whole school has been talking about. But the only way they can do this is if they cooperate with each other. The first mystery involves a mysterious form dressed in white that wanders the academy at night. The catch is that it won’t appear before women, so the girls have to sit this one out. Speak of the devil, there she is now! Go to it, ex-wires! Er, male ex-wires. As the boys deal with this ghost, Mephisto is summoned by Arthur Angel and his battalion to deal with a sticky situation involving a Gehenna gate! The ex-wires receive their next mystery assignment – a toilet mayuko in the girls’ dormitory! This time, the boys have to sit this one out, leaving Kamiki and Shiemi to take care of the matter. Why is Kamiki so reluctant to admit that Shiemi is her friend? While the girls go to it, the boys have their own preparations to make. This series just gets better and better! We thought the Impure King was a done deal, and now here comes the Impure Princess! We only scratch the surface of that, rather delving into the seven mysteries of the True Cross Academy. The first one, involving the figure in white, was hilarious, while the second one brought out more of Shiemi and Kamiki’s relationship. I think that bathroom spirit was a cross between Harry Potter’s Moaning Myrtle and Mean Girls. I enjoyed the encounter between Rin and Amaimon, though I frankly admit to hoping to see Rin thoroughly kick that guy’s a** someday. I enjoyed seeing Mephisto’s interactions with the angelic contingent. I really do not like Arthur Angel, and I hope Mephisto will bring him down to size, over and over. The ex-wires are developing, learning how to work together and get along. The more I read of this, the more I like it. Keep it coming! This entry was posted in Reviews and tagged Blue Exorcist, Book review, Julie Lynn Hayes, Kazue Kato, paranormal, Rin Okumura on December 3, 2018 by wedbriefsfic.